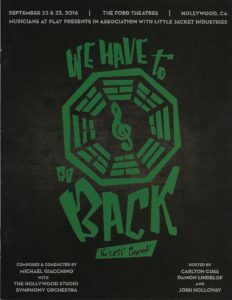 Oscar- and Emmy-winning composer Michael Giacchino conducted selections from his music for the TV series Lost over two nights last week at the Ford Theatre in Los Angeles. “Tonight is for you guys,” he told the crowd of Lost fans — who had flown from all over the world to attend (Friday night’s concert sold out so quickly that the producers added a second concert, Thursday night). Series producer Carlton Cuse co-hosted the event, which also featured a fun Q&A with composer and producer before the three-hour concert (whose musicians, Giacchino noted, consisted mostly of the same performers who played on the 121 episodes of the ABC series). The crowd was wildly enthusiastic and gave Giacchino and the musicians standing ovations both nights. Here is a review of Thursday’s concert. This entry was posted in Composers, Television Music and tagged Carlton Cuse, Film Music Society, Lost, Lost concert, Lost music, Lost TV series, Michael Giacchino on September 26, 2016 by Jon Burlingame.